“If anyone wanted to know who did the work for us we would be very happy to tell them it was HTG”. 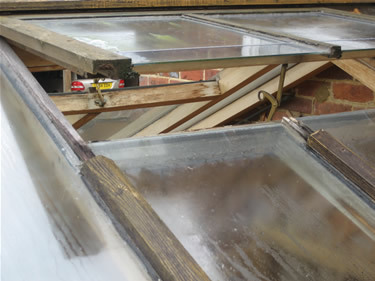 Before: The rotted beam and glazing bars are evident as well as deteriorated sealed units. 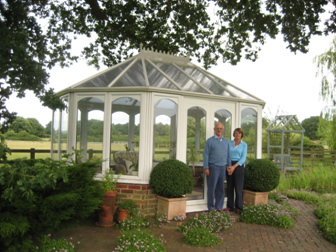 When you have a much-admired conservatory built from a special timber such as LIRIODENDRON (tulip wood) and the roof starts to leak, it is time to seek expert help – from HTG. 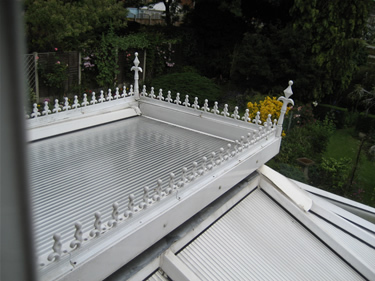 The 18-year-old conservatory had served Mr and Mrs Norris of Surrey well, but the roof had become rotten. They were keen that any new roof should match the rest of the structure which was still sound. 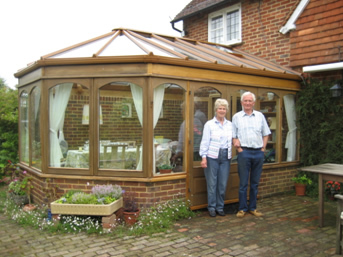 As the couple lie in a conservation area, planners often insist that structures like conservatories are made from wood rather than more modern materials. Before: poorly designed and sealed roof vent. 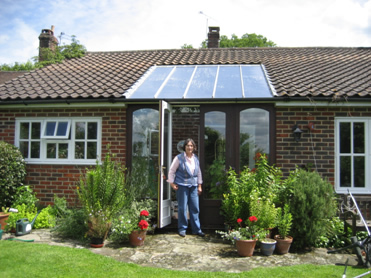 HTG’s answer was to install a modern aluminium roof, with high performance HTG double-glazed panels with heat reflectors. The aluminium was finished to match as closely as possible to the original. 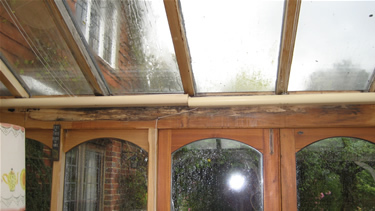 The extensive job also included replacing the wooden eaves beam, and varnishing and treating exposed timber. “One of the excellent things about the new roof is that HTG has done such a good job that people don’t realised that it is a new roof,” said Mrs Norris. “They matched the wood so well it looks like the original. Before: the sealed units have split and slipped. 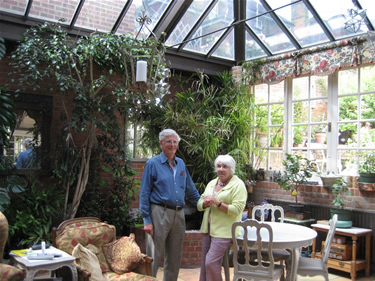 “The conservatory faces west so we get a lot of sun in summer, which meant that we needed blinds and then often it was still too hot to use it. “With the new roof we have been able to dispense with the blinds, and it is still cooler in the room. Which means that we can use it much more. 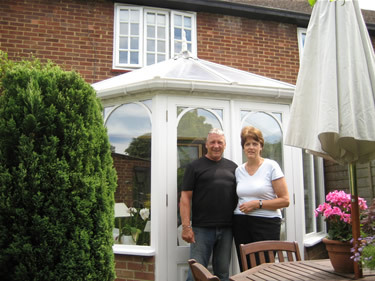 “We couldn’t use it all when it rained as the roof leaked and during the winter it was so cold. 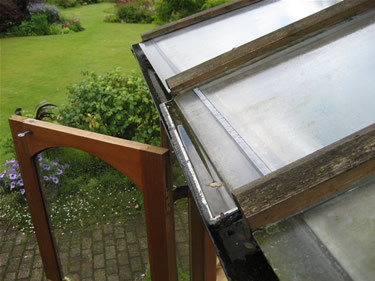 “But now it is dry, airy, cooler in summer and much warmer in winter – so we are getting much, much, more use out of it. 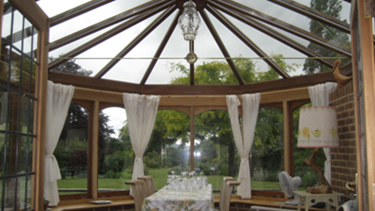 One advantage is that it is also much quieter in the conservatory since the roof was installed. Before: the conservatory is in general poor condition. “We are also pleased that we use less heating in the room now during the winter. 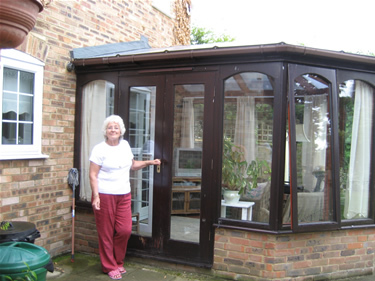 “HTG did a great deal of work, they replaced rotten timber struts and part of the door frame. “We were very impressed with the company. Their workers were very EFFICIENT , kept everywhere clean and they were a pleasant company to work with. 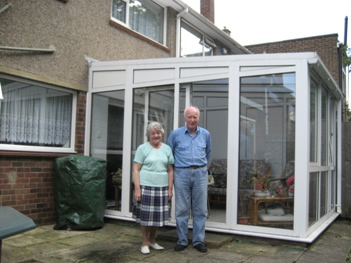 After: Mr and Mrs Norris outside their refurbished conservatory. 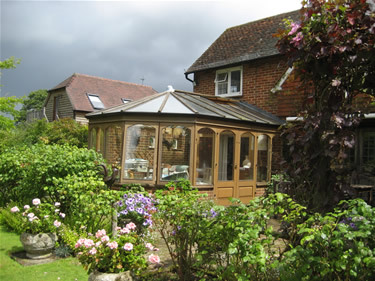 After: this internal shot illustrates the new roof with HTG sealed units.